This was a group project, on which I did nodeJS coding and threeJS coding for server and client side. 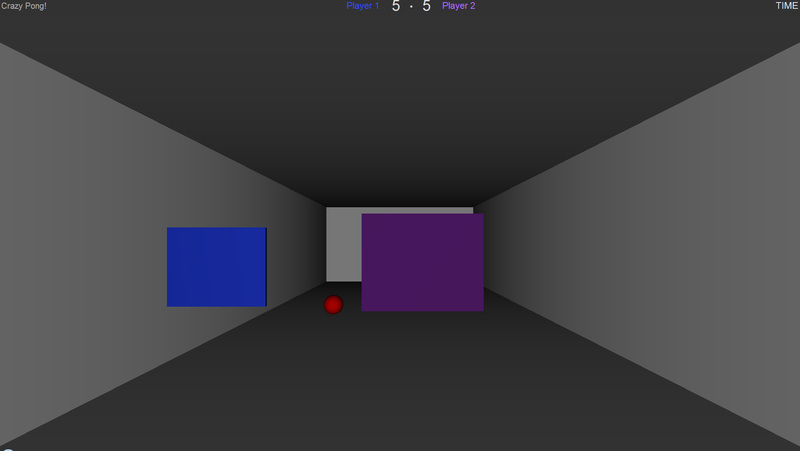 The Crazy Pong game using LeapJS, nodeJS and threeJS began with an exercise that I did in Canvas 3D. The goal of the exercise was to create a bounding box for a ball along with surfaces to show the limits of where it could bounce. Originally, the goal of the group project was to use threeJS to translate 2D creations of monsters into 3D models, then have these models viewable using an Augmented Reality app. After working with nodeJS for some time, the group decided to focus attention on creating a 3D game designed for multiple players. The decision to use Leap Motion as the input interface was one of prior experience with the technology and suitability in terms of the capabilities of the technology. The original Canvas 3D bouncing ball experiment used a simple physics engine based on rectilinear surfaces. Since a sphere will always hit a perfectly vertical or horizontal surface at its equator or pole(s) respectively, the bounce action would be a simple inversion along whatever axis the collision occurred. If a ball struck the bottom of our ball court while heading towards the player’s left, it would continue going left and towards the player, but its vertical speed would be reversed so it would then head up towards to the top. 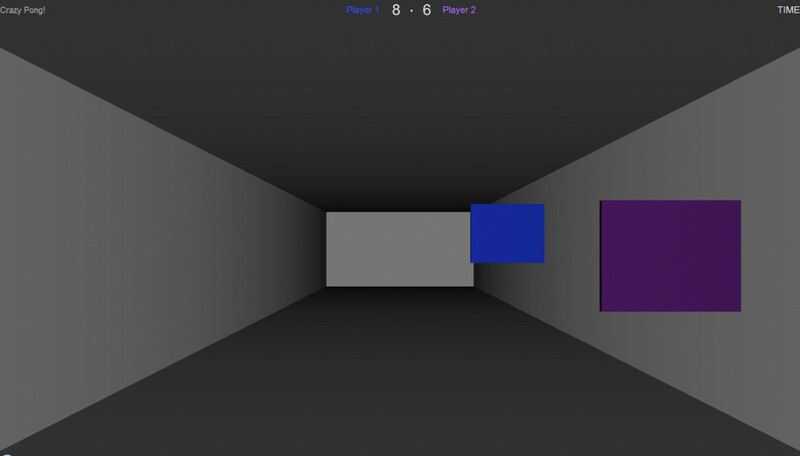 Taking a previously completed basic exercise involving moving a cube in threeJS using Leap Motion, a control program was created for a player’s paddle. LeapJS by default creates a data collection loop when a new Leap controller instance is created, which then outputs an object multiple times per second with all the data that the Leap controller collects. Some of the data points that Leap registers include the position of all fingertips and hands that it can recognize. The initial threeJS and Leap exercise used the position of one finger tip to control the cube on screen. For a squash game it was decided to use the position of a hand instead, so the previous code was adapted to track that type of position instead. The basic concept behind the graphics of the game was to have a court so the bounding area of the ball would be visible. Initially, this consisted of two simple planes for the top and bottom with their edges showing the extents of the court. Our second iteration had vertical walls on the sides to create a tube; the ends were still empty at this point. Getting all the wall surfaces to appear on screen was a challenge at first, but this was due to overlooking the fact that threeJS only places material on one side of a surface by default. In order to get light to bounce off a material and make an object visible, the material had to be explicitly assigned to all surfaces. Once this issue was solved, all surfaces appear properly. The final iteration of the court graphics had the 3D camera inside of a cube with an omnidirectional light source. This made the graphics much simpler since there is only one object instead of four for the court. The initial bouncing ball tutorial that the game was based on specified the movement of the ball in the x,y, and z using randomly generated numbers. The ball would then move every frame according to the speed specified for each axis. However, when adapting the ball physics to multiplayer, it was realized that speed variables would have to be set server side, or else every client would be generating speed variables independently and the balls would not be synched. The necessary code was placed at the very beginning of the server side program, then sent to the players when they connected. The basic physics limits consisted of bouncing the ball left or right if it exceeded the x position of either side of the court. The y and z limits applied to the top/bottom of the court and the ends respectively. Once this was accomplished, there was still the matter of bouncing the ball off of the paddles themselves. In order to accomplish this, all of the physics are done locally leaving the server just for passing the paddle positions. The first step was to constantly check if the ball x position fell intersected with a paddle, the check if the y positions intersected, and then the z positions. If all the checks were positive, then a collision is registered and the ball is bounced off the paddle. The physics engine for the paddles only works if the ball is coming towards the player, saving on processing time. We decided to ignore the ball if it bounced off the back wall; as a result, it will simply pass through the paddle from behind. To improve the UI, a sound effect was implemented on a successful hit instead of relying on the score updating to let someone know they scored. Also, the color of the paddle changes to green for both players when they’ve scored a hit, further improving the feedback when there is a hit. The color of the paddle is replicated in the top-most banner of the game, where each player’s label reflects the paddle color. This was implemented so that the player could recognize which score reflected their game-play.